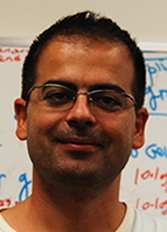 Hanan Dery, a specialist in the emerging field of spintronics, joined the Department of ECE in July, 2007. Previously, he was a Postdoctoral Associate in Lu Sham's group in the Department of Physics, University of California San Diego (UCSD). During this time, he worked on spintronics, seeking ways to integrate information based on electron spin into semiconductors. Dery earned his PhD in Electrical Engineering from Technion-Israel Institute of Technology in 2004. His PhD research was in optoelectronic nanostructure devices with a focus on nonlinear gain processes and carreier dynamic properties.